My preferred data management platform rests upon the PostgreSQL database. The most recent releases have been truly impressive, especially when you consider that the Postgres database is free software. Using Postgres for data management means integrating disparate data sources such as other databases, spreadsheets, flat files, etc into Postgres. There are two primary mechanisms for this: data loading and data virtualization. I’ll cover Postgres data loading in this post, including options for extraction, transformation, and loading (ETL). The tool I’ll use for this data import is the free Talend Open Studio. 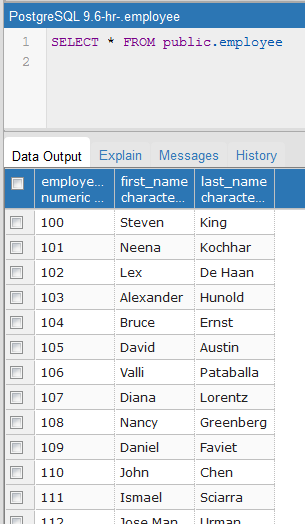 I’ll be pulling data from an Oracle Express instance with it’s Human Resources (HR) sample database. First trick was to launch Talend without error due to the presence of a Java 7 install on my system. Once I figured out the cause of startup failure, I was able to create a launch.bat file to make explicit use of a Java 8 install. start /B TOS_DI-win-x86_64.exe -VM "C:\Program Files\Java\jdk1.8.0_40\bin"
Talend OS starts up pretty empty, particularly the ‘Palette’ area on the right. Once selecting ‘Help | Install Additional Packages…’ and installing all required and optional packages, I was able to create a new Job by right-clicking the ‘Job Designs’ folder on left in my local project. Overall, once up and running, Talend’s tools for data integration seem quite powerful. In future, I’ll be looking at other palette components available.